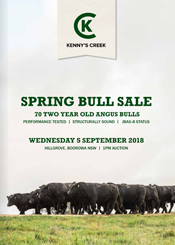 In a year where many of our customers did not make it due to drought, it was great to see so many new clients at Kenny’s Creek Spring Bull Sale. It was wonderful to see the regulars back amongst it at the sale to pick up some great valued bulls. MH Premium Farms bought five bulls, John Cleverdon (CT Cleverdon), Scotty Churchill, Dale Curtis, Bobby Miller (Coolac Cattle Company) and James and Baden Henwood (Stan Henwood Trust) all purchased four bulls each. A H147 son, good depth of body and softest in this bull. Out of the consistent G560 Highlander of Stern daughter, 5 progeny so far.